England fought through the third day to leave the fourth Test against India wonderfully poised in Southampton. Jos Buttler made 69, sharing stands of 56 with Ben Stokes and 55 with Sam Curran as the home side reached 260-8, a lead of 233. On a gripping day, there were times when England were in peril, especially at 92-4 and, after Joe Root was run out for 48, 122-5. But the determination of Buttler, Stokes and Curran left England with the edge on a wearing surface that is offering assistance to both pace and spin bowlers. India’s attack was threatening throughout, even if off-spinner Ravichandran Ashwin seemed hampered by the hip injury that affected him in the third Test at Trent Bridge. Still, the tourists are facing pulling off their highest run-chase to beat England in a Test. If they fail, England, who lead 2-1, will seal the five-match series. Who are favourites to win? Former England captain Michael Vaughan on BBC Test Match Special: “When you’re playing against a team with Virat Kohli in, you’re not going to sleep too well with the fact that you know he can play incredible innings – as can Cheteshwar Pujara. Ex-England spinner Phil Tufnell: “This game is still on a razor’s edge. You can’t take your eyes off it for a ball. Through their recent batting struggles – they were bowled out in a session in Nottingham – England have been criticised for a cavalier approach. Admittedly, their top order once again was found wanting on Saturday, but perhaps the only batsman culpable was Jonny Bairstow, who played an awful drive to the first ball he faced to be bowled by Mohammed Shami immediately after lunch. After that, on a pitch where batsmen can never feel truly secure, the middle and lower order battled with patience, discipline and restraint. Time and again the ball went past the bat and runs were earned rather than gifted, gratefully received by a crowd gripped by tension. Until late in the day, India were never more than a couple of quick wickets from being on top and could still face a manageable chase if they wrap up the tail quickly on Sunday. From England’s perspective, they already have something to bowl at and, given the nature of the surface, are probably now the more likely winners. 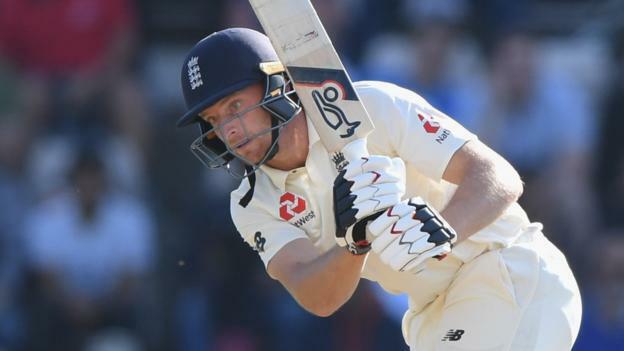 Buttler’s batting has been superb since he was handed a surprise recall to the Test side at the beginning of the summer, not least when he made his maiden century in Nottingham. Here, he arrived with England teetering after Root was run out and made batting look easier than any of his team-mates. Carefully choosing which balls to attack, he turned the ball off his pads or unfurled glorious, turf-skimming cover drives. At the other end, Stokes was almost shotless, intent on straight-batted defence until he edged Ashwin to slip for a 30 that came from 110 balls. But 20-year-old Curran continued the form and fearlessness he has shown in his four-Test career. Even after Buttler was trapped lbw by Ishant Sharma with the second new ball, Curran continued to 37 not out in the company of Adil Rashid, who was caught behind off Shami off the final delivery of the day. England have tinkered with their top order this summer – here they did it in the middle of a Test – yet they still lost their fourth wicket with less than 100 on the board for the 33rd time in 64 innings. From an overnight 6-0, England saw Alastair Cook’s run of low scores continue when he pushed at Jasprit Bumrah to be caught by a juggling KL Rahul at second slip. Before the Test, captain Root said England get the best from Moeen Ali when he bats at number seven. After 40 in the first innings, Moeen was promoted to number three, but fell in similar fashion to Cook, poking at Ishant. Meanwhile, Keaton Jennings, perhaps battling for his place, was growing in stature with sweeps off Ashwin, only to be trapped leg before by a skidder from Shami for 36 from the final delivery before lunch. From the first ball of the afternoon session, Bairstow lost his leg stump to a horrible stroke not at all befitting a top-order Test batsman. Captain Root, batting at four, overcame some early looseness to look solid, only to fall to Shami’s direct hit at the striker’s end when Stokes called for a very tight single. No player has been run out more often in 2018 than Joe Root (twice, level with Cheteshwar Pujara). Ben Stokes’ strike-rate in Tests this year is 37 runs per 100 balls. Sam Curran has reached 20 in his first six Test innings, one short of Douglas Jardine and David Steel’s record for England. India’s highest successful fourth-innings chase in a Test in England is 174.